Curly, Larry, Moe... and Shemp, Joe, and Curly Joe, too! American actors Moe Howard (1897 - 1975) and Curly Howard (1903 - 1952) shake hands as Larry Fine (1902 - 1975) looks on in a still from an unidentified Three Stooges film. Cinema has featured dozens of popular comedy teams over the last hundred years, but none have endured as long in pop culture as the Three Stooges. The comedy trio's short films were incredibly popular with audiences worldwide in the 1930s and 1940s, and the group experienced a similarly-successful revival on television in the late 1950s and the 1960s. 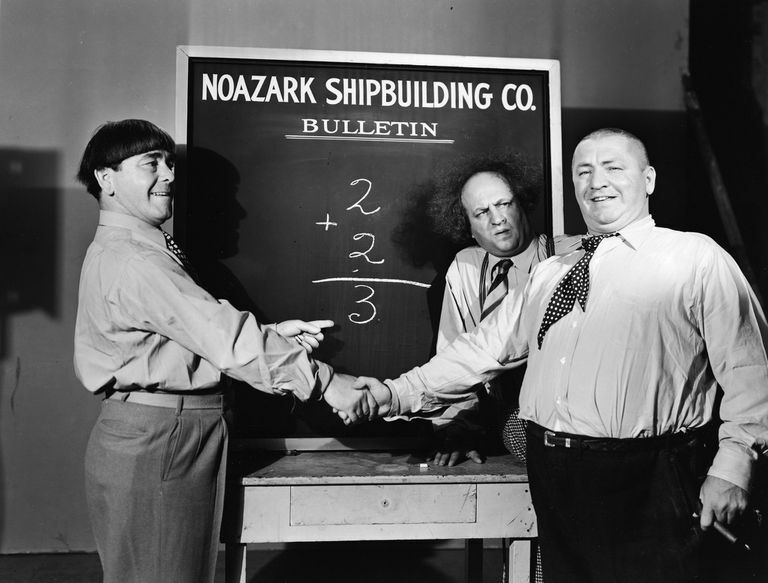 Though officially a trio, six actors served as members of the comedy team throughout its five-decade history, with two Stooges, Moe Howard (born Moses Harry Horwitz, June 19, 1897 - May 4, 1975) and Larry Fine (born Louis Feinberg, October 5, 1902 - January 24, 1975) remaining constant members, and several others—most famously Curly Howard (born Jerome Horwitz, October 22, 1903 - January 18, 1952)— filling the role as the third Stooge. The Stooges made 190 short comedy films for Columbia Pictures released from 1932 to 1959. The trio had renewed popularity in the late 1950s and 1960s when their earlier comedy shorts and new material were regularly played on television. In the early 1920s, comedian brothers Moe and Shemp Howard had been working in a vaudeville team with fellow comedian Ted Healy. Moe left the group to begin a career in real estate, but returned in 1928 several months after Shemp had been paired with comedian Larry Fine. The act was named "Ted Healy and His Stooges." Two years later, the Stooges appeared in their first film alongside star Ted Healy, Soup to Nuts (1930). They also mounted a tour of their own without Healy. Amid disputes with Healy, Shemp Howard left the group for a solo career in 1932. He was replaced in the group by Moe and Shemp's younger brother, Jerry "Curly" Howard. Healy and His Stooges would sign with Metro-Goldwyn-Mayer, where they appeared together in a dozen films (both short and feature-length) over the next two years. The four actors also appeared together in other projects for MGM in various duo and trio combinations. MGM chose not to renew the team's contract, which led to Healy and the Stooges ending their partnership. The Three Stooges would sign a contract with Columbia Pictures. After debuting for Columbia in the 1934 musical short Woman Haters as somewhat different characters, the Stooges appeared in their classic iteration in the comedy short Punch Drunks (1934), which features the now-famous plot of Curly playing a boxer who becomes incredibly skilled whenever he hears the song "Pop Goes the Weasel." Their next short, Men in Black (1934) was nominated for the Academy Award for Best Short Subject, Comedy (a category that would be removed after the following year). It is the only Three Stooges film to be nominated for an Oscar. By 1936, the Stooges' short films had become incredibly popular with audiences and they released eight per year for the rest of the decade. Very quickly the Stooges established their famous personas: Moe as the quick-to-anger leader who frequently attacked his partners with physical abuse, Curly as a childlike dimwit, and Larry as the "middle Stooge." In January 1940, the Three Stooges released the first Hollywood film to make fun of German dictator Adolph Hitler, You Nazty Spy! The Stooges' remarkable output continued through World War II. In 1945, the Three Stooges starred in their first feature film, Rockin' in the Rockies. The classic Three Stooges lineup appeared together for the final time with their ninety-seventh Columbia short, Half-Wits Holiday, which was released in January 1947. Sadly, Curly suffered a stroke during the final day of filming of this short and never returned to the team, though he appeared in a cameo in the trio's hundredth Columbia short, Hold That Lion! (1947). Jerry "Curly" Howard died on January 7, 1952, after suffering several more strokes. With Curly unable to perform, Shemp returned to the Three Stooges to replace his brother. Since he left the Stooges in 1932, Shemp had become a successful supporting actor in comedy films, and starting in 1944 he had also starred in his own series of comedy shorts for Columbia. Instead of imitating Curly, Shemp presented his own version of a dimwitted Stooge. For the first few years, the Moe, Larry, and Shemp team continued the great success of the Curly, Larry, and Moe era. However, with the popularity of shorts declining in the early 1950s the Stooges faced significant budget cuts and many of their new releases featured copious footage recycled from earlier shorts (for example, six of the Stooges' eight 1955 shorts contained recycled footage, as did all eight of their 1956 shorts). On November 22, 1955, Shemp died of a heart attack. Infamously, Moe and Larry completed four Three Stooges shorts left on their yearly contract with Columbia for 1956 release by recycling footage of Shemp from earlier shorts and having actor Joe Palma, who frequently appeared in Stooges shorts as a supporting character since 1937's Goofs and Saddles, stand in for Shemp. Though Moe and Larry were open to the idea of continuing as a duo, Shemp was replaced in the team with Columbia comedian Joe Besser, who often played supporting roles in Abbott and Costello films and on their television show. Besser was less of a physical comedian than Curly or Shemp, and his character did not receive much physical abuse. The Three Stooges only made sixteen shorts with Besser as a member of the team because Columbia halted production on comedy shorts at the end of 1957, though the shorts would continue to be released until June 1959, when the final Columbia short, Sappy Bull Fighters, was released. In almost 25 years, the Three Stooges starred in 190 shorts for Columbia. Columbia did not renew the Stooges' contract. While the market for comedy shorts in theaters had ended, the Three Stooges saw their popularity explode when their shorts began airing on television in 1958. Moe and Larry gained an entirely new, younger audience and realized that their careers as entertainers were far from over. To replace Joe Besser, the duo added comedian Joe DeRita, who cut his hair to appear more like Curly, whose popularity had grown with children because of the television airings of the Stooges' classic shorts. Joe DeRita went by the name "Curly Joe." This version of the group appeared in the Stooges' feature-length film, Have Rocket, Will Travel (1959). The Stooges made several more feature films, many television appearances, and voiced themselves in the animated series The New Three Stooges. While filming a pilot for a travel series featuring the Stooges in 1969, Larry suffered a stroke and was unable to continue acting. Though Moe and Curly Joe considered replacing Larry with longtime Stooge supporting actor Emil Sitka, the group never performed again. Larry Fine passed away on January 24, 1975, followed by Moe Howard, who passed away on May 4, 1975. 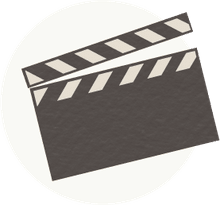 Over forty years after the deaths of Larry and Moe, the Three Stooges still remain incredibly popular, and the comedy team's shorts still appear on television and have been issued on many types of home media. Their slapstick personas and jokes (especially Curly's catchphrases) remain part of popular culture. A Three Stooges museum, dubbed the "Stoogeum," is located in Pennsylvania. A movie titled The Three Stooges featuring Chris Diamantopoulos (Moe), Sean Hayes (Larry), and Will Sasso (Curly) playing the Stooges was released in 2012. The Stooges continue to appear on hundreds of licensed products each year, including apparel, board games, scratch-off tickets, and even credit cards.